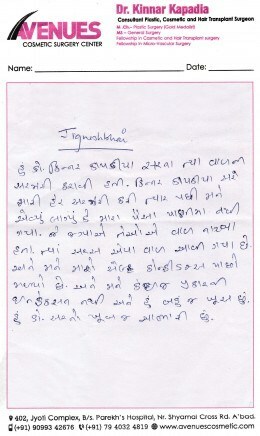 It was nice and painless treatment done by Dr. kapadiya.I am really satisfied with his treatment and the reasult. 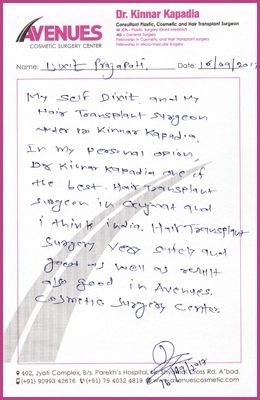 I darmesh pijeja coming here for hair transplantation on 7th month 2016.in operation therapy i have no pain,scar & any medical conditions happened for that i have to take medicine after operation.2 to 3 month later hair growth will begin and 6 month later i came here for more confident & looking good-better i really appreciated Dr.kinnar kapadiya and his team. Presently i am 38 & my hair loss / thinning was mainly due to stressful work & medicinal side effects which started in 2010. Prior to that had thick dark hairs. Researched few clinics in Ahmedabad before selecting my FUT treatment with Dr. Kapadia who not only helped me in re-gaining my new natural hair growth which boosted my confidence. The results within 8 months is MORE than expected. From a patients perspective, most important is getting a natural looking thick hairline growth & mine was at par which i had before. 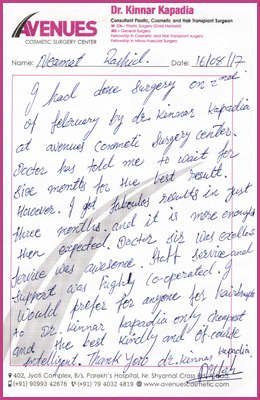 I am satisfied with Dr's expertise & his treatment in designing & results. DEFINITELY recommend visiting him, before finalizing elsewhere. Its excellent ,visit and get life changing experience. 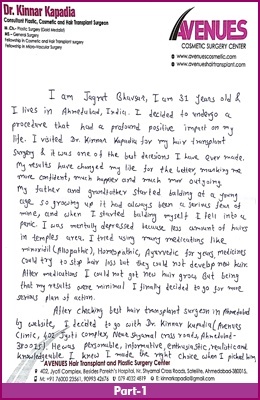 Avenues hair transplant is Best Hair Transplant Clinic in Ahmadabad. 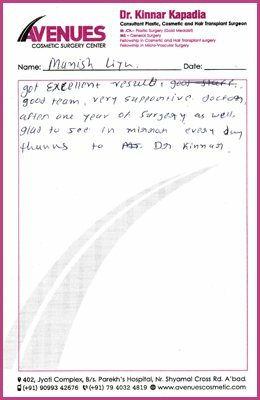 Dr kinnar Kapadia is very friendly and experienced doctor. 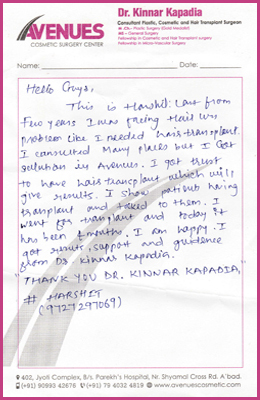 It's a great clinic with great staff.I must say he is excellent doctor for Hair transplant.